Cumberland County Seeing Eye puppy raisers meet monthly at the 4-H Center in Rosenhayn, NJ. Joan Maloney leads this group which has raised well over 100 puppies for The Seeing Eye. 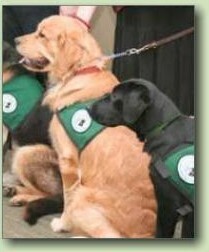 Puppies as well as puppy raisers have an enjoyable and educational time together. Puppy raisers are often asked, “Isn’t it difficult to part with your puppy?” Although this is certainly true, puppy raisers actually look forward to the "graduation" of their puppy and its transition into the service of a sight-impaired person. It is similar to parents who look forward to the graduation or marriage of a child, but the puppy raiser can always begin raising another puppy! Check "News & Events" for recent news.